A sportsperson like Nivethan Radhakrishnan is a rarity in modern-day sport. While there is never a shortage of players gifted in one way or another, Nivethan stands far apart. 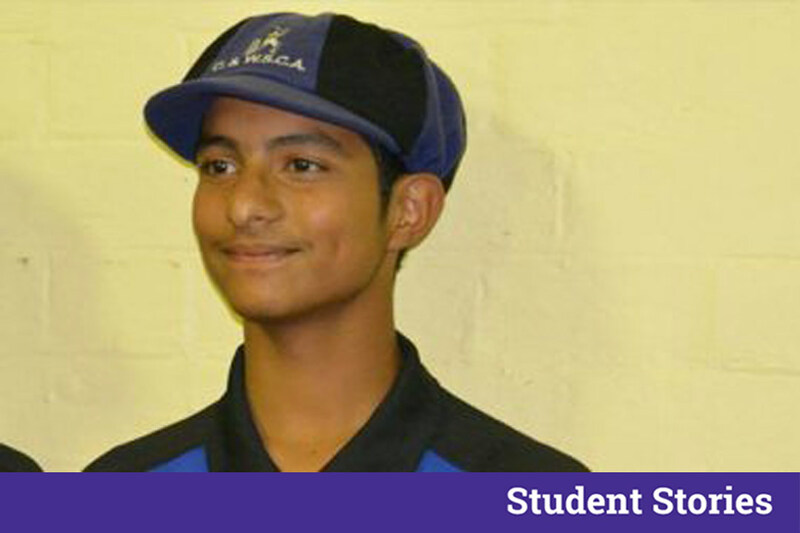 At the tender age of 14, Nivethan made a debut in Tamil Nadu Premier League (TNPL). Nivethan, a bowler who bowls left-arm orthodox, is an ambidextrous player he is equally comfortable bowling right-arm pace, off-spin, along with being an opening batsman. 1. How did your amazing career start and when? My recognition in this game began around in 2011 when I took a hat-trick in a fourth division league game in the state, I kept playing in Australia when my father moved there in 2012 for personal reasons. I kept on scoring runs and taking wickets, impressing Aussie legends Greg Chappell, Mark Waugh and Steve Waugh with a knock of 193 for New South Wales. But, India was in my heart, I came back and attended a trial with Kaalai after playing TNCA lower division league and got the management’s confidence, who then went about getting me in their squad. 2. Which Cricketer do you admire and what is the technique of the player you love the most? I love Sachin’s (Tendulkar) technique. But I want to emulate what Sir Garry did as a complete all-rounder. I love the West Indies team of his era. I have read almost 16 of his books and my game revolves around most of the techniques that I have read or learned through the videos I have watched of his. Right from a young age, I have been unorthodox be it batting or bowling. Having the benefit of using both hands, and bat well, the great Sir Garfield Sobers is one of my other inspiration; someone who himself used to bowl left-arm orthodox, Chinaman and medium-fast when required. 3. How did the Cricketer within you evolve? I don’t know what to say. Even before I started walking, I used to hold my father’s cricket bat. I liked this sport a lot when I was a kid and didn’t like watching TV. So, I had to play with what was around me and the only thing I found was my father’s cricket kit. As I grew up, I used to see my father and gained a lot of interest in cricket. No one forced me to take up the game. He taught me the basics and I started playing by myself. 4. Did you train yourself to use both the hands (following Sobers) or is it natural? Basically, the right has been my natural arm since my childhood. But, when it comes to cricket, I am ambidextrous. I started bowling right-arm off-spin and learned the art of bowling with my left hand as I continued playing. To be honest, I can close my eyes and bowl with both arms without any difficulties. Sobers has nothing to do with me bowling with both my hands. I started bowling with my left hand even before I became a fan of Sobers. In fact, I started bowling with my left hand when I was six. I wanted something to separate me from the other players. I tried this in the nets and it came out well. 5. You have played cricket in two leading nations for this support. How would you analyze your experience? When I started playing cricket in Chennai, it became a routine for me. But, when I went to Australia things were completely different. The people, the way they play the sport, the conditions, everything was new to me. It was a bit difficult for me to adapt, but my passion for the game, along with the hours I put in, made me overcome the hurdle. Now, I am used to playing in all the conditions. I have set my mindset in such a way that it is easier for me to play the game irrespective of the conditions. 6. How are your studies and sports are managed together? What is the reaction of your parents? My parents back me in whatever I do. My mom has always supported me when it comes to studies. My dad used to tell me that if I don’t concentrate on studies, he won’t allow me to play cricket. So, studies have always been my priority. I know whenever I study well, I will play cricket. More than my father, my mother wants me to excel in cricket. My father rarely inquires about my studies and my mother won’t do that too. 7. What led to your decision of coming back to India from Australia? Last season, I had come to India during the off-season (Australian winter). Once my vacation was over, I went back to Australia and did really well. So, I decided to come back to India again and give a trial with the Karaikudi franchise. I was not sure about getting picked in the trial and in spite of that, I gave one before heading back to Australia. When I got to know that I was picked in the TNPL draft, I was very happy and flew back to India again just in time for the tournament.